Discussion in 'Etrailer.com Trailers and Towing Forum' started by Steven Harris, Oct 31, 2018. New to us 2008 Rockwood Freedom pop up, and we can park it in our garage. However using an after market add on wheel on the trailer jack doesn't work well. The wheel attachment seems too wide in diameter and wheel tilts and will not turn or roll. 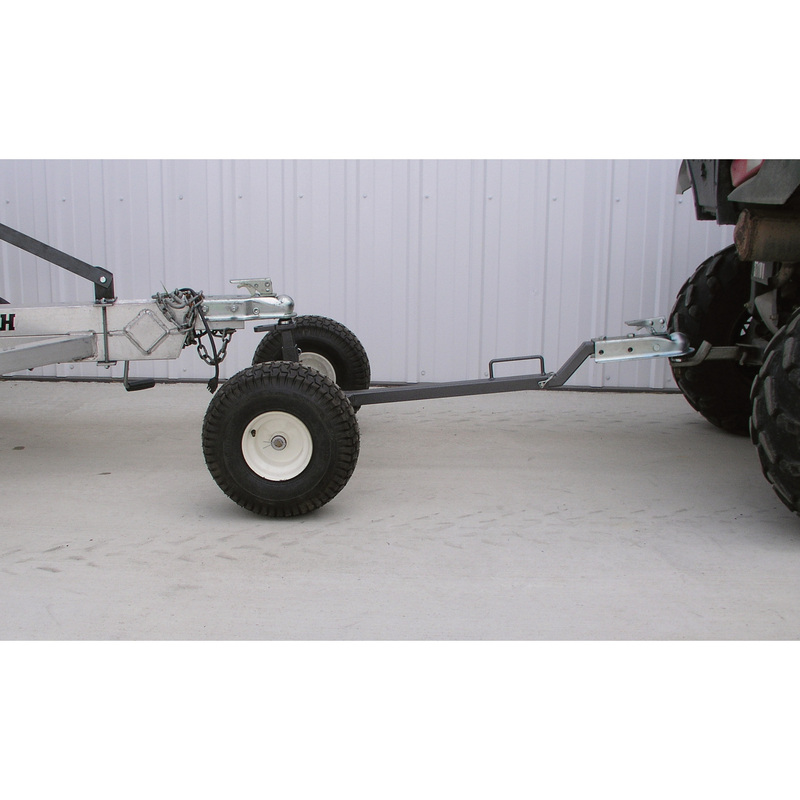 (see pic) Thinking about either new jack with wheel attached or getting a trailer dolly, costs are equivalent. What say you more experienced haulers. Which one is easiest to use? Before you ask, we have the riding lawn mower, but it's a hassle, so don't mention that option. Can't speak for the type jack you have. We have a swing away jack with the wheel and it works just fine. I'm sure other folks who have the type jack you have will chime in here with some good advice. First off the tube of your new wheel is too short and to big. Second maybe a non solid tire would work better. Steven Harris and WVhillbilly like this. Definitely the wheel assembly does not fit your jack. You may be able to find a piece of pipe to fill in the space to hold it a little straighter. Even straight, the wheel assembly will still sink in soft surfaces. I put a piece of wood under mine when I disconnect. How big is your camper? I have a larger 12' box with dinette slide. On the sought incline on my driveway I am unable to budge mine. In grass that type of wheel is next to worthless. As others have stated the socket on your wheel is too big for the shaft. It needs to be a smaller diameter and should have a taller socket. If you can find one with pneumatic tires that would help. Having our on the grass will make it harder though, especially if it is soft. I gave up doing the wheel thing on mine. A dolly would be better for me but with my incline I am really looking at a good powered one. I'll need one anyway when I move to a hybrid or TT. I have a trailer dolly from Harbor Freight. It works great on the driveway, not so good on grass. My trailers weight is ~2000 lbs. I have a swing away jack with wheel attached on the utility trailer and when I load just the lawn tractor onto it, it becomes almost impossible to move on any sort of softish ground.. Nephew has a similar jack on his 12ft aluminum fishing boat trailer and that too is a pain to move on soft ground.. It might be worth trying to un-hassle the lawn tractor idea.. It can be a pain to find the right wheel. There are many jacks out there. For the most part there is a 2-1/4in jack and a 2in jack, which is the tube measurement where the jack go through the A frame. Wheels mount on a lower tube. The OD of the lower tube for most 2-1/4" jack is 2" and for the 2" jack is 1-3/4in. Most popup campers have a 2in jack and have an OD around 1-3/4 inch on the lower tube" Some of the jacks have a size that only fits it. Most wheels mount on the outside (OD) of the tube, but there are some manufactures that the wheel go up inside the tube. I would measure the upper and lower tube. Get the manufactures info off the jack and see if I could find the wheel made my the manufacture. When looking for the wheel, watch out they can be listed using either the upper tube or lower tube. Make sure they are talking about the measurement you are looking for. This might work for you. It does for me. Dback2k4 and Steven Harris like this. I suggest a trailer dolly. The wheel on my camper is next to worthless unless on a nice smooth surface. The wheel is just too small and bogs down or gets stuck in a tiny divet. It also depends on how heavy the camper and tongue is. my camper is over 3000 and well it ain't going anywhere without a dozen extra hands. My old camper was only about 1500 so between two people we could pickup the tongue and direct the trailer so much easier and the tongue wheel wasn't being used except if we didn't line the hitch up exactly and need to give it an extra inch or two push. 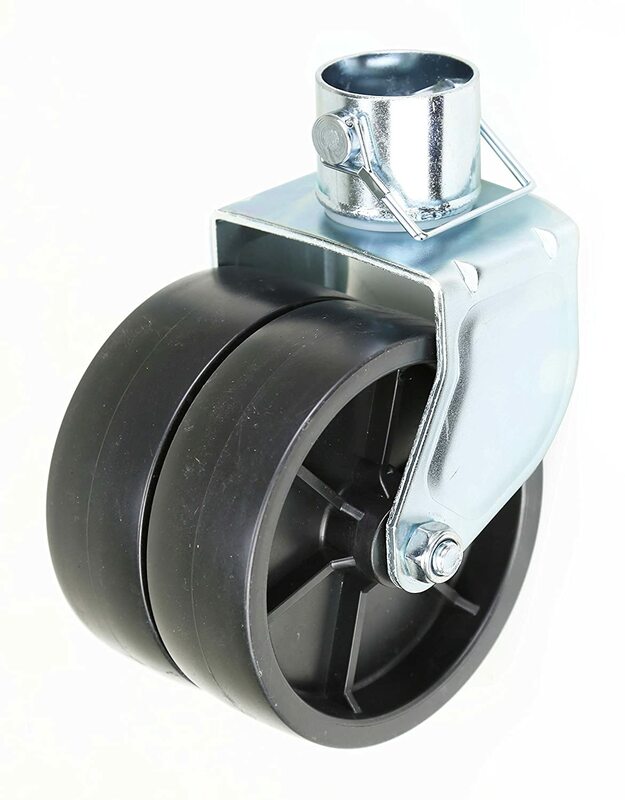 Our Jayco has a wheel that fits on the bottom of the tongue jack but the wheel would never be facing the right direction, you would have to try and lift the tongue to get enough weight off it that you could rotate it. The cheap harbor freight dolly I got works great, difference is night and day. So much easier than using that small wheel. That being said make sure you have help and someone is ready with wheel chocks in case the trailer starts to get away from you. Just chiming in as another Freedom 2800 owner that had to replace the jack. The jack is a 1 7/8" jack. It's a weird one, and almost nothing fits it. It's manufactured by BAL. The hole in the frame that it mounts to is too small to take a 2" jack, unless you want to try and modify the mounting plate. Trust me, I know. The hard way. Even on flat smooth ground, I've never been able to budge mine. It's very tounge heavy. To the point where I attempted to move via my lawn mower, and it bent the little hole that I had the Ball mounted on. I've been eying this for a few years, but haven't bought it yet. I use a trailer valet I picked up second hand. Works really well on asphalt, gravel and dry grass It has a brake and 2 gears, one for flat and one for hills I'm able to move my big PUP around by myself and into my driveway It's a bit bulky and expensive but very convenient . I would like to throw some grease on the fire. I like that dolly that hooks up to the ATV or lawn mower ... But I could never back it up ..... way beyond my skill level. I just connect are popups directly to lawn mower ....... that I can back up. That is true Raycfe, I don't think I'd ever be able to backup a double tandem. I've put off doing anything about it for about 2 years, so it's not a pressing need. Although I will say this year I stored my camper in a "Garage In the Box" for the first time, and getting it in there was quite difficult. With that tandem rig, it would have been impossible. The front door of the garage points towards woods, and a tree was too close. I had to back the camper in on an angle, and straighten out at the last second. Having a ball on the lawn tractor would have greatly simplified the operation. Fits pretty good, and then I piled all my lawn and garden crap back in. Thanks friends, I went a third direction. Lol Replaced my trailer jack with 2 inch model, 2k lbs. It fit the wheel I had much better and now the wheel does its job. Barely fit my trailer. Such a nice sharing community. Thanks again. It sounds like you got the right size jack for the wheel you had. That makes a big diffrence. Dont buy anything from E trailer.com. They get my orders wrong most of the time. Lasted order, I had to press all the 9/16 studs out and replaced them with the right 5/8 studs. I ordered 6 leaf spring from them. Most of them broke within 6 mos. I will never order from them again.